While it is a widely held belief that youth and entrepreneurship go hand in hand, research finds that more successful entrepreneurs launch their enterprises in their 40s than in their 20s. Star innovators such as Bill Gates, who was 19 when he started Microsoft, Steve Jobs, 21 when he started Apple, and Mark Zuckerberg, 19 when he launched Facebook, have reinforced the longstanding impression that young people are the wellspring of entrepreneurship. Systematic data on firm founders, however, suggest that this impression is false. In Age and High-Growth Entrepreneurship (NBER Working Paper No. 24489), Pierre Azoulay, Benjamin Jones, J. Daniel Kim, and Javier Miranda provide evidence that, on average, successful entrepreneurs are middle-aged. They analyzed administrative data from the U.S. Census Bureau on more than 2.7 million business founders whose companies subsequently hired at least one employee. The mean age of founders was 42. 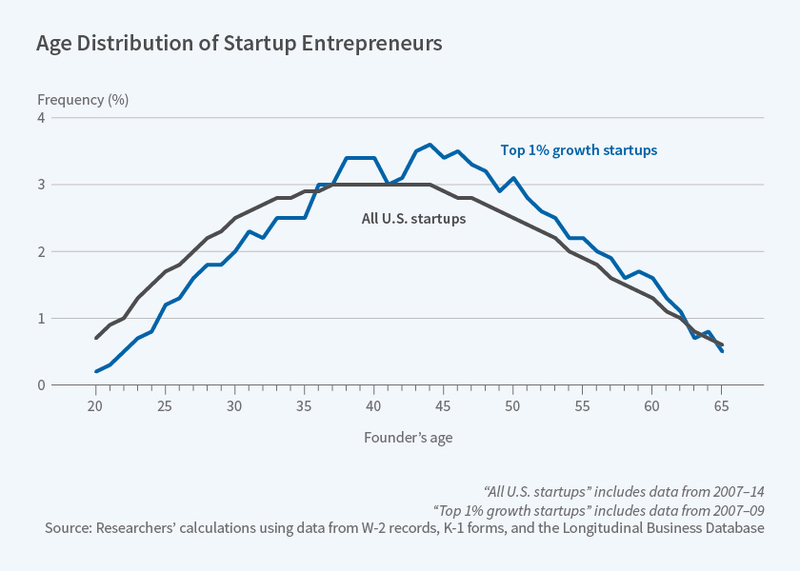 When looking at the highest-growth startups in the economy, the mean age at founding rose still higher — to 45. The study explores not just the age of founders, but the factors that are correlated with firm success. Founders with prior work experience closer to the specific industry of the startup, and founders with longer experience in that industry, have substantially greater success rates. "For the 1 in 1,000 highest-growth firms, founders with three or more years of experience in the 2-digit industry see upper tail success at twice the rate" of founders with no experience in the 2-digit industry, the researchers report. The study takes two approaches to examining growth-oriented startups. The first considers technology orientation, which can suggest the potential for high growth. The second considers the actual outcome for the firm, based on the three-, five-, or seven-year time window after founding. Using third-party venture capital databases, the researchers determine whether a given company has received venture capital financing. They argue that such funding is suggestive of substantial growth potential. They also use employment growth and sales growth as defining characteristics of a high-growth new venture. "...[C]omputing-oriented ventures as well as wireless telecom ventures appear to have the youngest founders," they write. "Yet even here the mean founder ages range from 38.5 to 40.8..."
The study also explores geographical heterogeneity, and separately considers California, Massachusetts, and New York. These three states account for the majority of high-growth startup activity in the U.S. Even in these states, successful entrepreneurs are still middle-aged. The youngest entrepreneurs in this part of the analysis, whose mean age was 38.7, were founders of venture capital-supported companies in New York. When the set of 2.7 million founders was reduced to the 1,900 associated with companies that were both located in entrepreneurial hubs and received venture backing, the mean age of founders was 39.5. The researchers conclude with a comment about current practices in the venture financing industry. "To the extent that venture capital targets younger founders, early-stage finance appears biased against the founders with the highest likelihood of successful exits or top 1 in 1,000 growth outcomes."